alaTest has collected and analyzed 401 reviews of Samsung Gear 360. The average rating for this product is 4.2/5, compared to an average rating of 4.0/5 for other Camcorders for all reviews. People really like the design and durability. The image quality and portability also get good views. We analyzed user and expert ratings, product age and more factors. Compared to other Camcorders the Samsung Gear 360 is awarded an overall alaScore™ of 96/100 = Excellent quality. For simple 360-degree video and photos, the Gear 360 is great. You'll just need the right Galaxy phone and a Windows computer to complete the picture. The Samsung Gear 360 captures the best video we've seen from a 360-degree camera, but editing is a real pain and you need a premium Samsung phone to get the most out of it. 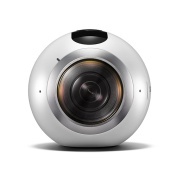 Best-in-class 360-degree video. Attractive price point. Compact design. Protected from dust and splashes. Solid battery life. 360 Degree View. Virtual Reality and 360 degree photography are the hype and Samsung is delivering what the customer wants with a new camera. In this review, we will check to see whether the camera is worth the investment. 2016 is the year of the affordable 360 degree camera and one of the highest quality models available comes from Samsung. It's limited to working with a newer Samsung phone, but you will also see good output from the white ball. What does the new 360-degree camera from Samsung bring to the table and is it better than other cameras? We find out, in this Samsung Gear 360 review! Samsung wants to give the everyday person the ability to create Virtual Reality content. With VR being the next aggressive market, the Samsung Gear 360 VR camera is thus born. Read to see our trial with this pocket-sized VR shooter.